JewishWorldReview.com | "There is not a fit," was the only feedback as he cleaned out his desk. "At least on the Titanic they had some warning between when it hit the iceberg and when it sank," he said. But the pink slip was not the first indication his career was on the rocks. He chose to ignore the warnings. If you are wandering in the wilderness at work, you cannot afford to ignore warnings when your boss and colleagues see the void between expectations and performance. Signals saying your career is about to hit the iceberg may be obvious to everyone but yourself. The most common suggest you are separated, isolated, have deviated, are deprived and have a realization that things are not right. But the right career strategies keep these warning signs from turning into a pink slip. Many organizations put senior employees in the better offices with greater access. I once interviewed very low performers in an organization to determine what was wrong with their careers. I realized each one had an office either in a different part of the building or in a different building from their departmental colleagues. A few were in outlying regions or overseas  out of sight, out of mind, out of work. They were not around to eat lunch or go after work with colleagues and missed out on the valuable informal conversations that built trust and relayed important informal information. Career strategy: Make the effort to be in the same place with colleagues and superiors. If you have an office in a remote place, take time to visit others, have informal conversations and be seen. Initiate lunch and/or dinner with those who are connected. Social isolation is the clearest indication of a career crisis. When people gather formally or informally, and you are not invited is social isolation. Sometimes it is intentional, but most often it is not. The habit of daily routine keeps you out when you should be in. Other employees have senior colleagues and mentors who "watch their backs." Career Strategy: Get invited to the right formal meetings. Ask your boss and colleagues to attend. Also, build informal mentoring and collegial relationships. Find out where people are having lunch, invite colleagues out for dinner or drinks, travel with others and make social connections. What happens when you are zigging and the company is zagging? Perhaps you are associated with the old product line, the less profitable part of the business, or even a part of the business that might be for sale. Your skills, business connections and interests are in the past while others are working for a different future. Career strategy: Strategy is for everyone in the organization, not just the leaders. Know where the company is going and what technologies will emerge. Be the one who sees new market opportunities or strategic relationships. Often customers and competitors will tell you where the currents are leading. Read websites and trade publications and follow university research. Be a champion of the future rather than a defender of the past. Twenty minutes a day of developmental reading might prolong your career by years. Are others getting rewards that you are not? Higher salaries? A better bonus? Better work assignments? Rather than shout "no fair," ask why. "How can I increase my contribution and raise my performance to their level?" is a much better question than accusing the salary system and management of being unfair. The truth is they are unfair. It is always unfair. Career strategy: If you are not required to have a development plan, make one. Meet with your supervisor and tell him or her what you are doing to be a more valued employee. Show in writing that you are taking classes, working on a degree, going to association meetings, and learning what is needed to be at the next level. Career employees grow throughout their careers. People with jobs stop learning and sometimes stop working (and stop getting paid). A caution: If the person in the next cubicle is making more and doing less they are much more vulnerable to termination. Sometimes a slightly smaller paycheck is a good insurance policy. Often anger is a sign of denial, fear, and frustration. 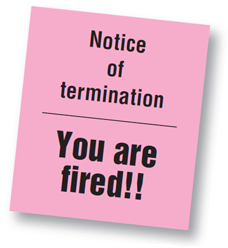 Threatening to quit, sue, or report to a higher authority are generally signs that you have looked at your own performance and are worried. Rather than deal with yourself, it is easier to blame others. That is not to say that there are not bosses or coworkers who may deflect their wrongdoing toward you. (I once had an abusive boss who said I reminded her of her ex husband.) But it is easier to face the abuse of others when you realize your own weaknesses. Career strategy: If you blow it, own it. Don't hide it. If someone else blows it, own it, help them. If you are wrongly blamed, solve the problem before you argue that it was not your fault. Problem solvers are the most highly valued employees in the company. Even the best careerists find themselves unemployed for a period in today's corporate turmoil. Mergers, acquisitions, bad bosses and management can cause the best to miss a few paychecks. Never burn bridges. Leave with dignity and respect. Thank your coworkers. Stay in touch with colleagues. You never know where your next job will come from, and it might be one of them. Scott C. Hammond, PhD, is a professor at the Jon M. Huntsman School of Business at Utah State University. He is the author of "Lessons of the Lost: Finding Hope and Resilience in Work, Life, and the Wilderness."